So last night I was able to make it to an auction. I didn’t know if I would feel like going since I haven’t had much energy lately, but late in the afternoon, I started to get excited about finding some treasures, and I was ready to go. And I am so glad I did. I actually completely filled every square inch of my van. I should have taken a picture to show you, but I think you will get the idea from these pics how much stuff I packed in. And Amanda went with me and found some great things as well. 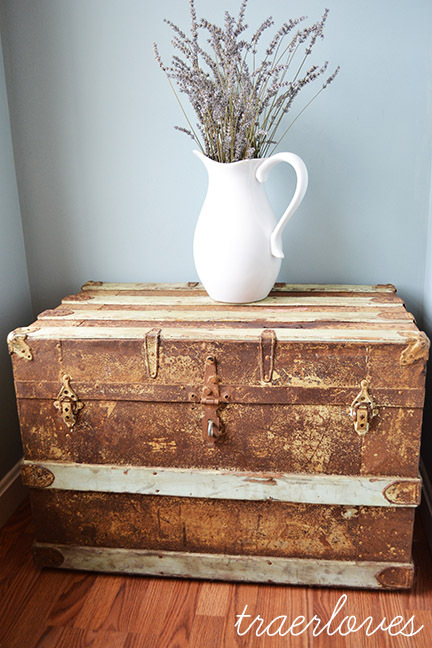 I absolutely love this trunk! It has great patina and would make a lovely coffee table for a love seat. It actually had a few treasures inside when I opened it up last night (as you can see in the picture) so that was an extra bonus! 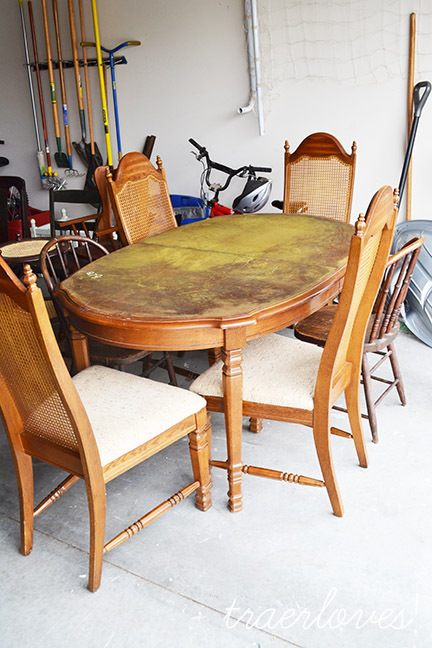 I am also very excited about this dining room set I scored for $40. Yes I know it looks like it came straight out of the 90’s but I assure you it will look fantastic when I am done with it. Those lines are just lovely on the chairs, and I believe you can never go wrong with a caned back chair. I am thinking off white chalk paint and grain sack upholstery on the chairs. Either a red or blue stripe. And don’t worry that is not green mold on top of the table. The previous owner must have glued a mat to the top, so I will be getting a sanding work out when it is warmer outside! I also got quite a few other chairs too. They all need a little glue, and some TLC, but they have great potential. The little retro bar stool will look fab after I scrub it down with a little Braso! And I can’t decide if I want to paint the youth chair or leave it a natural wood finish. So I guess I have a some work to do over the next few months. Most of what I bought last night probably will not be ready until the Luckett’s fair, but I will keep you posted on their progress. 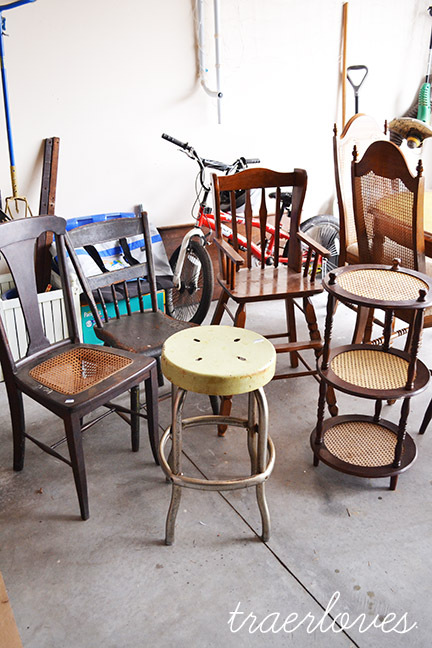 However, I will be taking the retro stool to the February barn sale to go with my kitchen island! Enjoy the rest of the day and I hope everyone has a great weekend. I am off to bake some cookies with the kids while the snow is softly falling! P.S. Yes, every single one of the items shown in these pictures fit in my mini van! And Amanda had some other pieces not shown in the pictures! I am the queen of real life tetras! This entry was tagged home decor, home decor ideas. Bookmark the permalink. oooh the dining set will be gorgeous! great finds, friend! Thanks Sarah, the trunk sold before I could get it down to the barn!